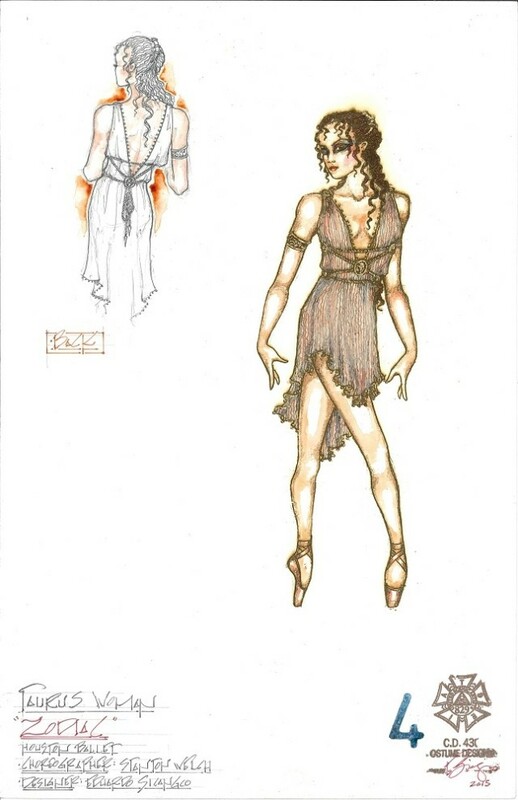 Costume designs for Zodiac, provided by Houston Ballet. From the original choreography to the hand-stitched costumes, the Houston Ballet's new show, Morris, Welch & Kylián, looks like a knockout. The program features two world premieres: Stanton Welch's Zodiac, which tells a story based on the Greek astrological signs, and Mark Morris's The Letter V, which promises light-hearted fun. Rounding out the program is Jirí Kylián’s modern work Svadebka. There's a 20-minute intermission between each performance. The music should provide something for everyone. Two pieces feature classic composers—Haydn (The Letter V) and Stravinsky (Svadebka)—and there's also a commissioned suite by composer Ross Edwards (Zodiac) featuring the Houston Chamber Choir. What to expect from that last piece? The sensual costumes come courtesy Eduardo Sicangco, whose designs have been featured in shows at Radio City Music Hall, on Broadway and at productions from ballet troupes around the world. Dancer Madeline Skelly as Taurus from Welch's original, Zodiac. The program runs through June 7 at the Wortham Theater Center.